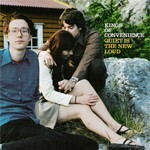 This is much like my previous recommendation, Zoe Johnston’s music – simple and beautiful acoustic folk music, with vocals, acoustic guitars, and: VERY good lyrics – this is my favorite Kings Of Convenience album since I first heard it 4 or 5 years ago. I felt Riot On An Empty Street and Versus a little boring. Technically, the songs have a few problems (if we can call them problems). For example, some of the tracks contain low freq rumblings – maybe a big truck passed the road near the studio during recording, or something went wrong with the tapes (the album was recorded using Studer tape machines) – and the last few tracks contain high frequency noises, but these flaws are negligible. Their song (not from this album) called Free Falling is in my 6th Dreamport mix. You can find more info about the band here, and prelisten their songs here and here.